Click on this dress to see more Flapper dresses! The “Roaring Twenties” is renowned for its exuberant parties and jazz music, which were reflected in the glittering fringed fashion that women wore. Flapper Style, on exhibition at the Kent State University Museum through September 4, 2016, looks beyond the quintessential beaded dress to explore the range of influences on fashion from sportswear to artistic movements such as Bauhaus and Art Deco. Standards of beauty in the 1920s shifted to celebrate youth with a fashionable silhouette that was slim and boyish. Flapper Style exhibits fifty some jazz-era dresses and suits, along with hats and shoes, organized into specific themes to illustrate fashion trends throughout the decade and show the evolving dress styles and shapes during the 1920s. For instance, hemlines rise, waistlines drop, beading intensifies. 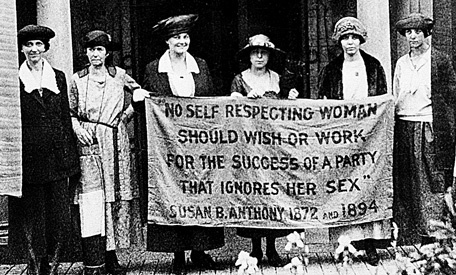 Women fighting for the right to vote in 1920. The vote was granted that same year. Due largely to the traumatic impact of World War I, the 1920s saw an intense shift in social norms, especially for women. Free to work and participate in the war effort, many American women were unwilling to return to traditional roles of domesticity; rather, they sought emancipation both politically and socially. Many young people – both men and women – were disillusioned with the world their parents had created. World War I brought unbelievable devastation, and for this, many youth blamed the traditional establishment. While the end of WWI left American youths bitter, the dawn of the 1920s also saw enormous financial prosperity in the United States. Expendable income matched with a desire to flounce tradition meant the younger generation fueled new leisure markets, eagerly searching for places to relax, dance, and drink. An illustration by John Held Jr. The flapper has become an almost mythical creature, flouncing around jazz clubs in New York City swilling hooch and smoking cigarettes with her hoard of male friends. Initially a lively young girl whose hair was not yet worn up (some suggest the term flapper stems from the way a girl’s braids would flap against her back), by the 1920s, the term ‘flapper’ was commonly used to suggest a new breed of woman. They were the generation of young women who came to age just as World War I ended and shocked the older generation with their short hair and short skirts, their drinking and smoking and swearing. Flappers faced a world strikingly different from the one their mother’s knew and their clothing reflected this dramatic break with the past. Jazz swept the club scene introducing new dances which insisted on close contact between partners and athletic movement from all involved. 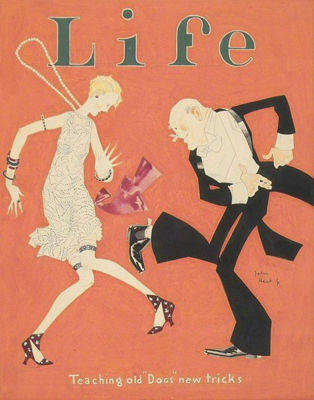 Overall, the flapper enjoyed a lively lifestyle, much more active than the previous decade. In addition to dancing the Charleston in speakeasies, sports took a prominent role in the new American image. Golf, swimming, baseball and riding were all immensely popular and attended by both men and women. This new active lifestyle required simplified and streamlined fashions, whether dancing the night away or spending the day on the links. Generally, the fashion of the decade was a tubular silhouette enhanced with pleats, panels, and fringe. This website is organized into major themes present in 1920s fashion, just as the exhibition Flapper Style is organized. Clemente, Deirdre. Dress Casual : How College Students Redefined American Style. Chapel Hill: The University of North Carolina Press, 2014. Davis, Mary E. Classic Chic: Music, Fashion, and Modernism. Berkeley: University of California Press, 2006. Fitzgerald, F. Scott. The Crack-Up. New York: New Directions Publishing, 1945. —-. The Great Gatsby. New York: C. Scribner’s Sons, 1925. Lehman, LaLonnie. Fashion in the Time of The Great Gatsby. Shire Publications, 2013. Lussier, Suzanne. Art Deco Fashion. Boston: Bulfinch Press, 2003. Moore, Colleen. Silent Star. Garden City, NY: Doubleday, 1968. “The Flapper.” The Smart Set, 1915. Warner, Patricia Campbell. When the Girls Came Out to Play: The Birth of American Sportswear. University of Massachusetts Press, 2006. Weill, Alain. Parisian Fashion: La Gazette Du Bon Ton, 1912-1925. Paris: Bibliothèque de l’Image, 2000. Wednesday	10 a.m. to 4:45 p.m.
Thursday	10 a.m. to 8:45 p.m.
Friday and Saturday	10 am to 4:45 p.m.
Sunday	Noon to 4:45 p.m.